Last minute cancelation...depending on number $3,000+ this week only. The Levy-Neafie House is one of the highest rated historical structures by virtue of its architecture, design, age and location. Large spacious rooms with high ceilings allow the cool ocean breezes to sweep through the home. Air conditioning in the bedrooms provides those who prefer air conditioning to have their choice. Its location across from the Congress Hall Hotel gives it a superb location, close to the center of town and 1/2 block from the beach. Nearby restaurants are walking distance as is the shopping district and nearby boardwalk parallel to the ocean. A large living room and open air porches all lend a Southern feeling to this home. Antique furnishings with Victorian pictures on the walls further give this home its authenticity. 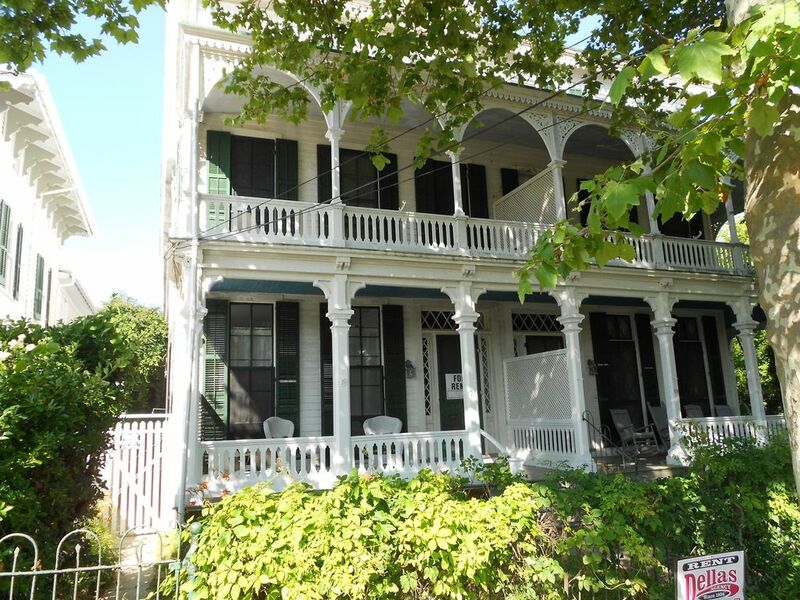 The owners will try to give you the insider's guide to Cape May while you stay in this home. We are very close to the ocean and Congress and Windsor Beaches. We are half a block walk from the beach areas. We are half a block from the beach and across the street from Congress Hall Hotel. You can see the ocean from the 2nd floor porch area. You can see the ocean from the 2nd floor porch. on site parking for one car, otherwise off street parking is nearby without meters. plates/serving dishes/flatware/bowls/pots and pans/various size bowls/misc. Our family has vacationed at Avalon for 50 years but enjoyed the stay at the Levy-Neafie House as much as any place we have stayed. The close proximity to the beach and the shopping area was wonderful. The house is charminingly decorated in with Victorian furniture and wonderful paintings and prints. All of the bedrooms were very spacious and comfortable sleeping. We appreciated the room air-conditioners for sleeping purposes but liked the fresh air downstairs and the high ceilings kept things cooler, even in the 100 degree afternoons. Although the kitchen is smaller, the proximity to the larger dining room and the buffets made meal preparation and serving nice for a larger family. The ambiance is wonderful - a truly victorian vacation experience. We will be coming back next year. We are very close to the Washington St. mall with a large variety of restaurants, shops, bars and attractions. We are also very close to the Congress Hall Hotel which has a spa, restaurants and shopping open to the public.